I drank beer at Wapping Wharf, looking out at all the shipping containers full of places to eat and drink, and I thought about Reading’s powers that be turning down a similar idea near St Mary’s Butts. 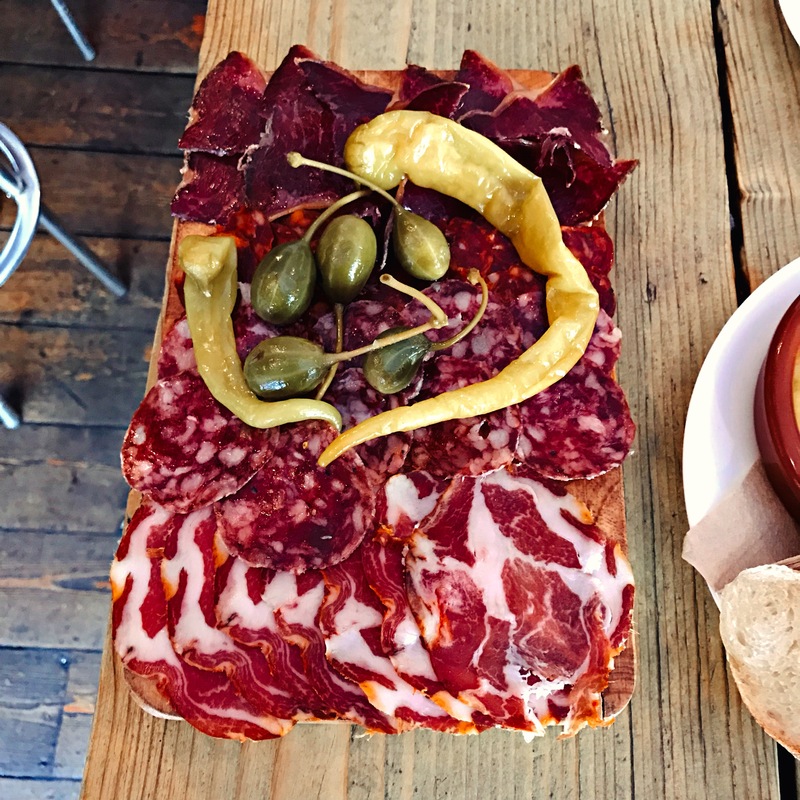 I had terrific tapas at Bravas: blue cheese sticky with orange blossom honey, perfect charcuterie with caperberries and pickled chillies, bread with golden, punchy aioli. I went to the Bank Tavern, what looks like an old man pub in the middle of the old city, and I ate slow-cooked lamb ragu with sturdy gnocchi and a dusting of dukkah. I drank beer at the Small Bar with a group of new friends (including, surreally, a table of Belgians playing Uno). I had a fantastic weekend but I found myself reflecting on the train home from Temple Meads, simultaneously elated and deflated. In three days I’d visited independent café after café and restaurant after restaurant, and I constantly wondered why this had all taken hold in Bristol when Reading still had so far to go. Was it greedy landlords, or our blinkered council? Reading was a prosperous place, so why didn’t it always feel that way? That trip inspired this week’s feature, but before I start I do want to say that none of this detracts from how good Reading is and how far it’s come in five years of writing Edible Reading. But loving a place also involves being able to hold up a mirror and be honest about some of its shortcomings. So yes, we have good restaurants opening but far too many of the new openings inside the IDR remain chains – small, prosperous, “good” chains, but chains none the less. The farmer’s market, although it’s starting to show welcome signs of expanding its pool of stallholders, still has much to do. Our council lacks imagination and ideas, and Reading CIC pays lip service to independent businesses at best (coincidentally setting up a poorly-promoted blog and Twitter feed on the subject just around the time that the Business Improvement District comes up for renewal). Oh, and the Hexagon is still crap. So here’s my list of the five things I still thing Reading desperately needs. Plenty of items almost made the list, and when I mentioned on Twitter that I was writing this piece I got plenty of comments which chimed with the near misses. So yes, I’d love a good independent bakery in the town centre – Warings just isn’t central enough – but the new repurposed Tamp Culture site on Castle Street has just opened selling produce and might fill that gap. I’d dearly love a Japanese restaurant on the same level as the brilliant Misugo in Windsor, and yet I feel like I should investigate relative newcomers Oishi and Sen Sushi because one of them might prove to be exactly that. Reading is missing a good butcher that could compete with the likes of Machin in Henley or Green’s of Pangbourne, and a delicatessen. Personally I’d like a properly cosy and conspiratorial wine bar like Le Barav in Paris, Gordon’s in London or one of my favourites, John Gordons in Cheltenham. But then again, the Tasting House may not be perfect but it’s moved a long way towards being that kind of space over the last five years, and we’re lucky to have it (especially now it serves such lovely coffee during the day). Anyway, I could go on, but better to get to my actual choices: the five additions I’d most like to see to Reading’s food scene. You can tell me what I missed in the comments. Good quality, coarse, herby bangers: none of your weirdly smooth mechanically recovered dross. Bacon, ideally smoked and streaky, cooked until it barely bends and could almost snap: no place for highlighter-pen-pink rubbery back bacon in the perfect breakfast. Slices of sourdough toasted just right and buttered up to the very edge. Crumbly black pudding, mushrooms cooked in butter by somebody who understands how to get them right, smooth rich scrambled egg that hasn’t been overheated into yellow pellets. 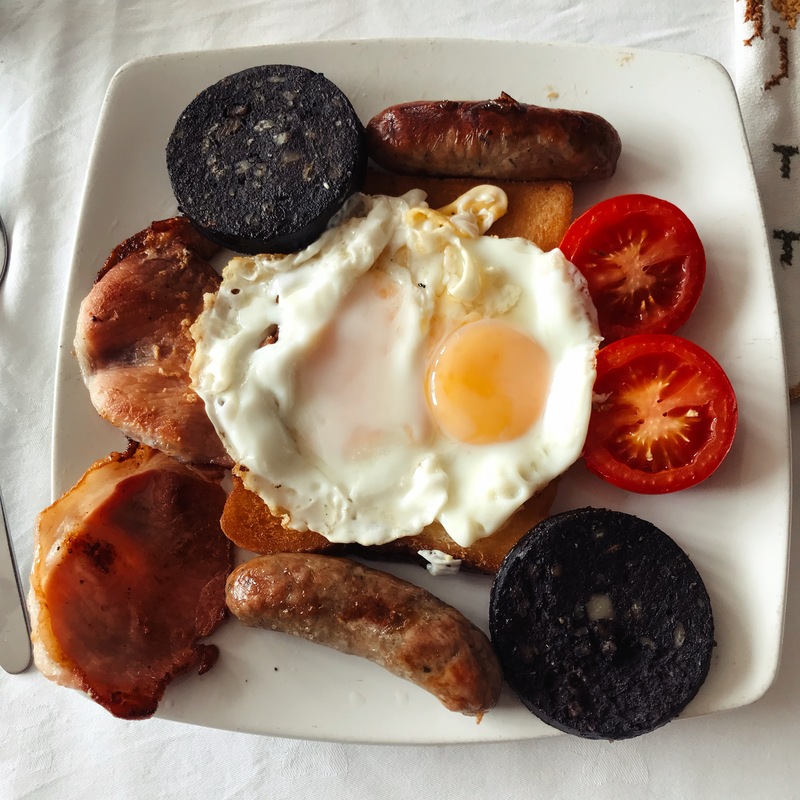 All the rest – baked beans, tomatoes, fried potato, even hash browns – is just a bonus, provided you get that lot right. And yet nowhere in Reading does. The lack of a really remarkable breakfast has long felt like one of the biggest gaps in the market in Reading. The chains don’t offer anything remarkable: Cote is by some distance the best of a bad bunch, but beyond that it’s hard to get excited by the likes of Bill’s. Reading has greasy spoons, but I think you can safely say they aren’t getting their stuff from the farmer’s market on Saturday. They have a devoted clientele, but I’ve always thought you can look into Munchees and almost smell the existential despair: maybe the windows of Rafina Coffee Lounge are smoked for a reason (I had an omelette at Rafina last year. Never again). That leaves the indies, and it’s surprising how few of them even try to serve breakfast. Picnic makes much of its breakfast but last time I went their avocado on toast was almost literally that, cut up and plonked on a solitary slice of toast for a fiver. Shed has a breakfast selection, but it’s very limited. Richfields looks like a better bet, and Café Yolk has its fans (and it was better last time I went than the woeful occasion when I went on duty) but both are a little way out of town. As is the lovely Fidget & Bob, whose scrambled eggs have been recommended to me in the strongest possible terms by people I trust. The Handle Bar Café in Oxford does a brilliant cooked breakfast as does Beany Green, an Australian café a five minute walk from Paddington Station tucked away by the canal. But really, there are so many blueprints for good cooked breakfasts and it beggars belief that Reading has nothing even in the same ballpark. 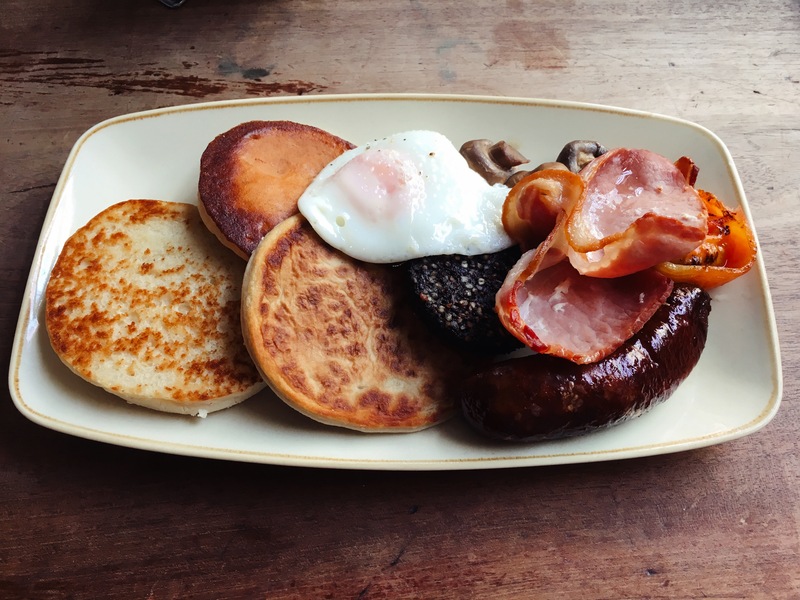 In Belfast I had an amazing breakfast at Harlem Café which was not only delicious – black pudding, potato scones, sausage and bacon all present and correct – but so beautiful that it could have been a still life (you can see the photo further up the page). One of my favourite breakfasts is served in Wraysbury, where my dad lives, at a place called Keating’s Delicatessen. It looks like you’re eating in somebody’s front room, and to all intents and purposes you are. The proprietor, Pat, is a snow-haired Irish gentleman who has been leading my father gastronomically astray for the best part of twenty years. There’s a limited menu, and he’ll pretty much cook anything you want, but on a standard day you get generous helpings of bacon, proper sausages from the butcher, black pudding sliced thin and done crispy, mushrooms with a whack of curry powder and home made chips that are almost like the scraps at the bottom of the bag. I went once and Pat was cooking sausages – on order – for a customer’s dog. That dog, in Wraysbury, had a better breakfast than you can currently get in the centre of Reading. Conceal your surprise, but I think it’s Bluegrass BBQ. I can take or leave much of their food (although the Southern fried chicken isn’t half bad) but the breakfast is quite lovely: properly smoked crispy bacon, good quality sausages, baked beans with strands of pulled pork and quite magnificent hash browns. The baked eggs aren’t everybody’s taste, but as an over easy fan they suit me just fine. Personally I recommend asking for extra bacon, but then I would. One of the London trends that’s not yet made it to Reading is the small plates restaurant. Generally that’s never bothered me enormously, but I do wish our town had a good tapas restaurant. I Love Paella came closest, but was probably most like that in its first incarnation operating out of Workhouse Coffee; when it moved to the Horn and the Fisherman’s Cottage, it was probably more of a traditional starters and mains kind of a place. I still think there’s space for a proper tapas restaurant in town – good cheeses, slices of jamon and and a small selection of dishes for sharing, whether that’s an ever so slightly gooey slab of tortilla shot through with soft slices of potato and topped with flakes of salt, an earthy dish of chickpeas and spinach or crimson chorizo, cooked in cider, the juices perfect with bread – if you have any left after you’ve dunked it in the sunflower-yellow aioli, that is. Oh, and there should be sherry – several kinds – and, in the best of all possible worlds, Alhambra on tap. If you’ve been to anywhere even remotely like this you know what I’m talking about, and if you’ve ever been to Picasso in Caversham you know that it’s emphatically not there. And it’s not Thames Lido, either, where the tapas (like everything else) is just a little too little for much too much. 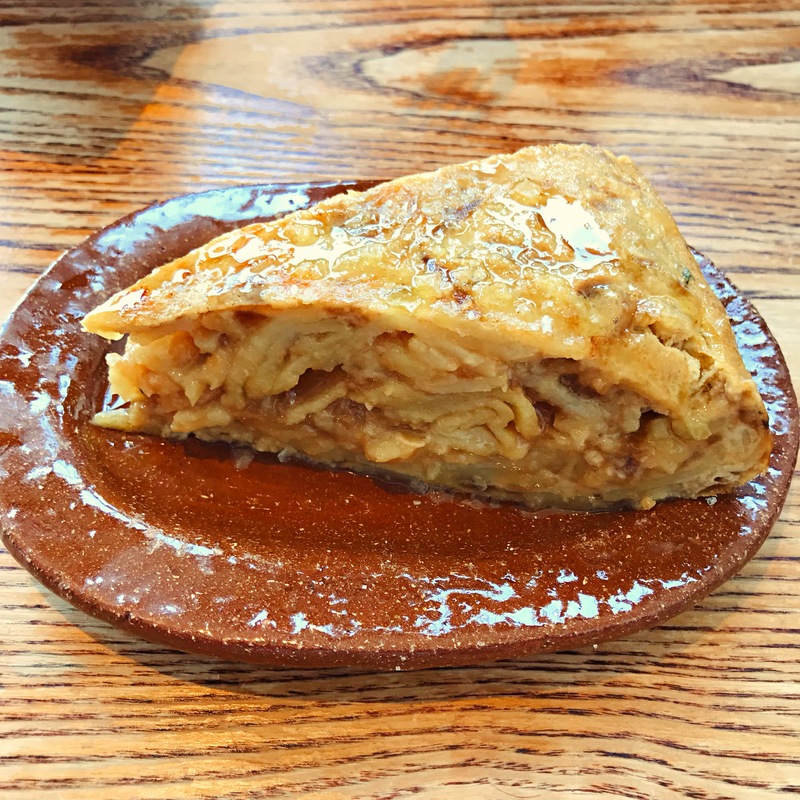 As a regular visitor to Granada, there’s nothing I’d like more than to clone one of its brilliant tapas bars – the likes of Bodegas Castaneda or Taberna La Tana – and drop it in Reading (ideally in the site of the old Nino’s, which is totally wasted on that estate agent). Standing at the bar at one of those two, drinking your fino or your vino tinto, ordering bits and bobs without abandon is truly to spend time in one of my happy places. A recent trip to the superb Bravas, off the Whiteladies Road in Bristol, had my body in the West Country but my mind thoroughly transported to Andalucia: mentally I was already planning my next trip to Spain. Closer to home, though, you can have an equally brilliant experience down Oxford’s Cowley Road, where Arbequina has been one of my favourite restaurants of the last two years. From pork belly smothered in mojo verde to slow cooked ox cheek in Pedro Ximenez, from sourdough toast topped with ‘nduja, honey and thyme – possibly not that Spanish, but never mind – to the stunning tortilla further up the page (I always mean to order a portion all to myself, and I never do) I haven’t had a bad dish in that restaurant. On one of my visits, the waiter proudly told me that the kitchen was so simple and the menu so straightforward that they could teach most chefs to cook the whole lot in a week. Nothing to do with faff and fiddle, just about buying really good ingredients and treating them with the respect they deserve. How hard can it be? There really, really isn’t one. Much as it pains me to say this, the closest you can get – in spirit only – is The Real Greek. I had a very nice meal when I went there, and it’s the only place I can think of in Reading where eating and sharing small plates is not only actively encouraged but really it’s the only choice you have. So go there if you fancy small plates by all means, but if you want tapas take my advice and get on the train to Oxford one Saturday morning. Well, Tutti Frutti really: Reading’s never recovered from the closure of its top-notch ice cream parlour in the unfashionable part of Reading station late last year. We have a lovely open space in the shape of Forbury Gardens, we had the grand re-opening of the Abbey Ruins in June after ten years closed, it’s been baking hot for most of the summer and it’s been hugely saddening that I couldn’t get off the train and pick up a little tub of Paul and Jane’s perfect peach and amaretto ice cream to eat while loafing in the sunshine. Of all the closures since I began this blog it’s this one – more than Brebis, more than the Plowden Arms, more than Dolce Vita – that has most disappointed me. And yet many people in Reading probably didn’t even know it was there: we didn’t know what we had, and one day it was gone. Oh, and don’t tell me that Dreamz or Creamz or Treatz or whatever they’re called fill that gap, and don’t try and convince me of the delights of Sprinkles Gelato (he’s always sounded like a camp mafia boss to me, locked in constant battle with rival don “Mr Cod”). I don’t want a dessert parlour that rips you off with waffles and cheap squirty cream. I want a proper ice cream café. I first fell in love with ice cream on the Ile Saint Louis in Paris, queuing outside Berthillon with all those Japanese tourists for my own little piece of salted caramel heaven. But things went up a notch this year – in April I went on holiday to Bologna where I was a frequent visitor to Cremeria Funivia, an amazing gelateria there. The fior di panna ice cream – unflavoured, unsullied even by a hint of vanilla – was an absolute revelation, as was the idea that ice cream could taste simply of itself. Every time I went I had the fior di panna and a couple of other flavours and left wishing I’d had the courage of my convictions and left the other flavours out. Closer to home George & Davis in Oxford’s Jericho (and its two siblings elsewhere in the city) prove that such places can flourish in Blighty. There are few pleasures that can top a couple of scoops of G&D on a hot day, and one of the main ones is a G&D milkshake. 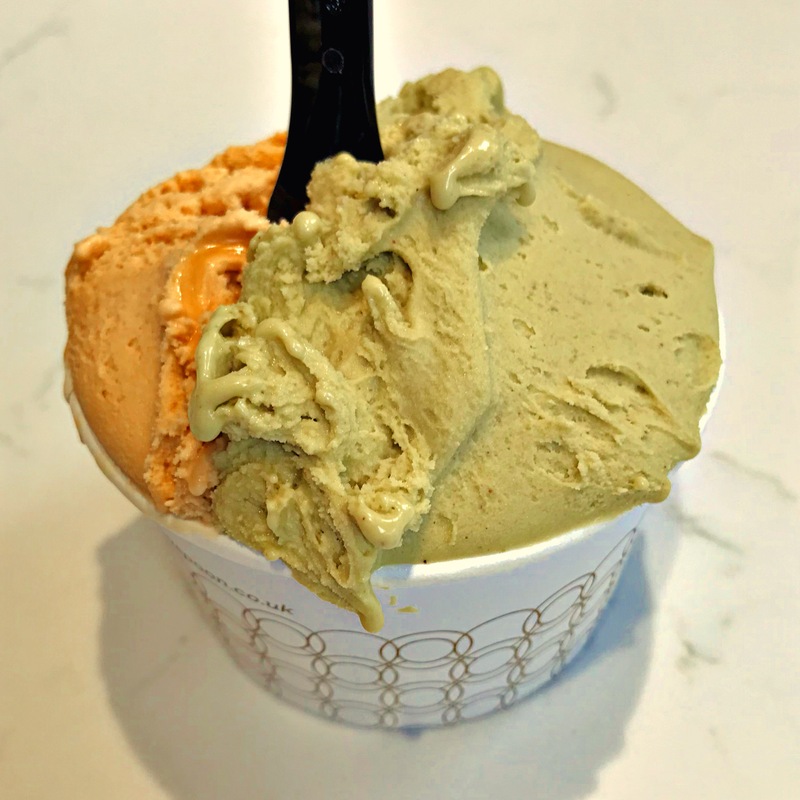 And without wishing to keep going on about Bristol, Swoon Gelateria at the bottom of the city’s Park Street served me pistachio and salted caramel gelato, both of which made me come over all unnecessary. Thames Lido does good ice cream, but at ridiculous prices, and you can hardly just turn up there for a scoop in a cup. I have a soft spot for the chocolate ice cream at Franco Manca, and it’s much more sensibly priced, but again you can’t take a seat and order only that. I used to laze in Forbury Gardens and buy a miniature tub of ice cream from Carluccio’s, and then they stopped selling them. This is a gaping hole, and the sooner someone enterprising starts exploiting global warming the happier we’ll all be. In the meantime, short of getting Doctor Who to tip up in the Tardis and whisk you off to Tutti Frutti, you’re properly on your own with this one: take me with you, if she does. This sounds like a funny thing to say about a town with such a thriving coffee culture, but here goes: Reading is lacking a truly great café. I’ve long thought that the three must-haves for a café are great coffee (obviously), a great selection of food and chairs comfy enough that you feel like you can settle in for a proper chinwag. Nowhere in Reading quite manages more than two out of three. I know that’s controversial, but but hear me out. Yes, some of the food in Picnic is lovely but the coffee is iffy and the chairs, crammed in to that tiny space, are the kind you long to leave. Shed does wonderful sandwiches but the furniture leaves something to be desired, and the coffee’s some way from perfect. 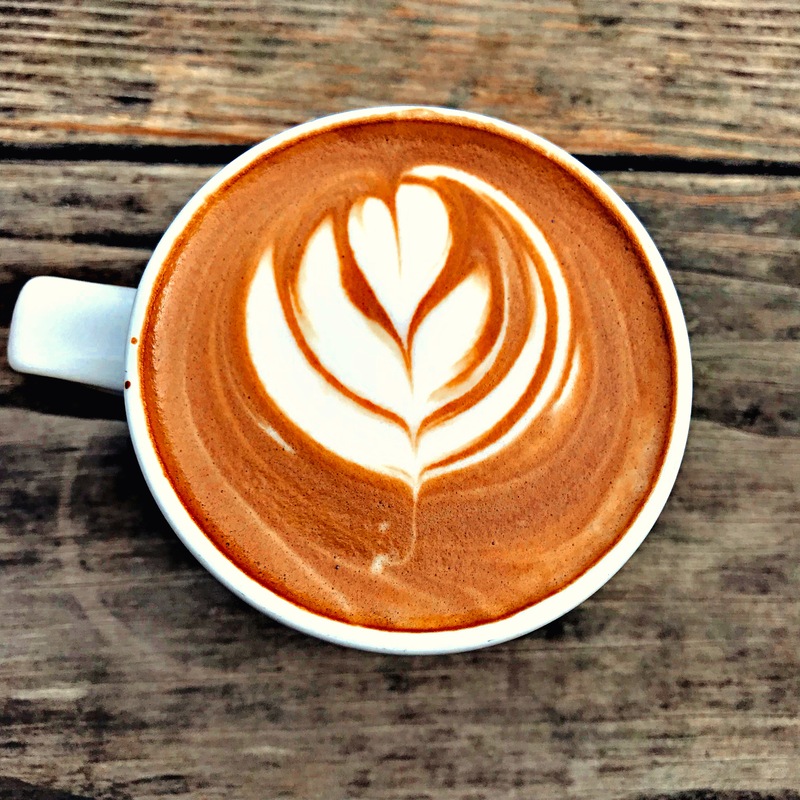 So what about places that do really good coffee? Workhouse does some excellent food, but it’s not a comfortable place to linger (and the lattes are served so lukewarm I sometimes wonder if they’re trying to move you along as quickly as possible). C.U.P. isn’t the comfiest, and handsome though the fit-out of their second branch is, it’s still the sort of clinical look that doesn’t make you feel like taking your time. Not only that, but the food’s really hit and miss. The only cafés that get the comfort factor right, sadly, are the ones you wouldn’t really choose to frequent. So yes, the Costas, Starbucks and Neros (as you’d expect with all that money to invest) do that much better. But really, don’t we want Reading to be better than a bucket of Starbucks coffee with your name on it or a lukewarm Costa panini? I hope so. When I was in Bristol I made a couple of stops at Boston Tea Party, the miniature chain which started out in Bristol but now has branches across the West Country and beyond. There was lovely furniture, a wide-ranging menu covering breakfast lunch and beyond, vegan and vegetarian options at every step of the way, milkshakes, smoothies, local beers, the whole shebang. I sat in the lovely garden, a natural sun trap (Reading could do with more of those, too) both times, and both times I had a note perfect mocha. There are about 25 BTPs: I really wish one of them was in Reading. 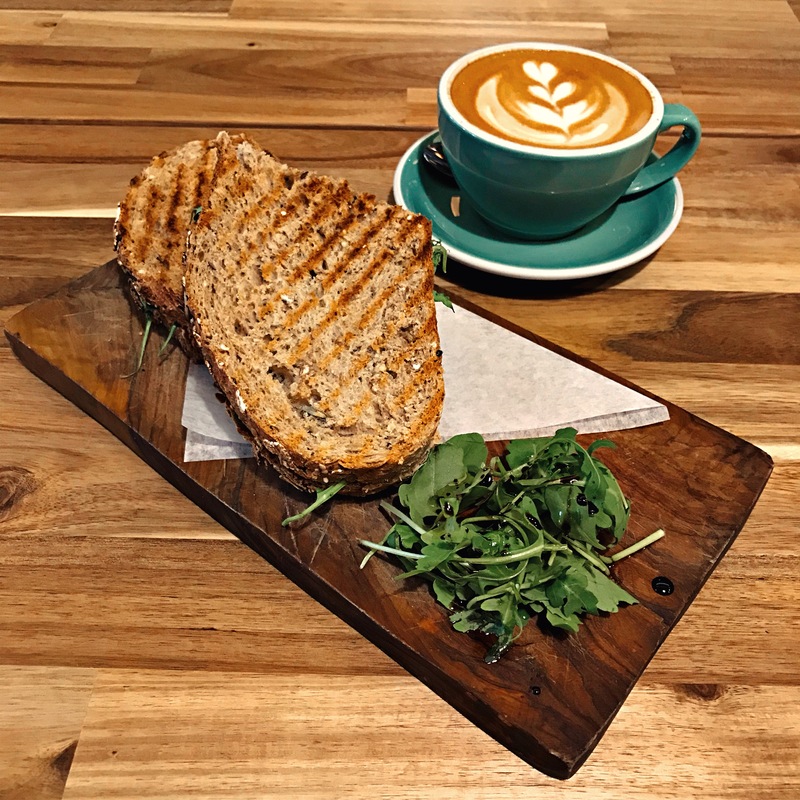 Although Reading doesn’t have anything quite like Boston Tea Party, the closest to that blueprint is probably Anonymous Coffee which has made a big impact since opening in the Tasting House earlier this year. It’s definitely a step up from the reclaimed plywood and punishment chairs so popular in purist coffee shops, the cakes are very good and the toasted sandwiches are creditable, although a tad pricey for what they are. Oh, and Phil behind the counter is charm personified, but don’t tell him I said. One of the requests I get for recommendations more often than most is for somewhere to eat for a special occasion, whether that’s to celebrate a birthday, an anniversary, friends visiting from far away or anything else. Speaking as someone with no kids who loves eating out, I’ve always thought any evening can be a special occasion if you want it to be hard enough, but I do understand that urge to treat yourself, to have a proper blow-out somewhere that’s a cut above. And whenever I’m asked for advice I always struggle with recommending anywhere in town. 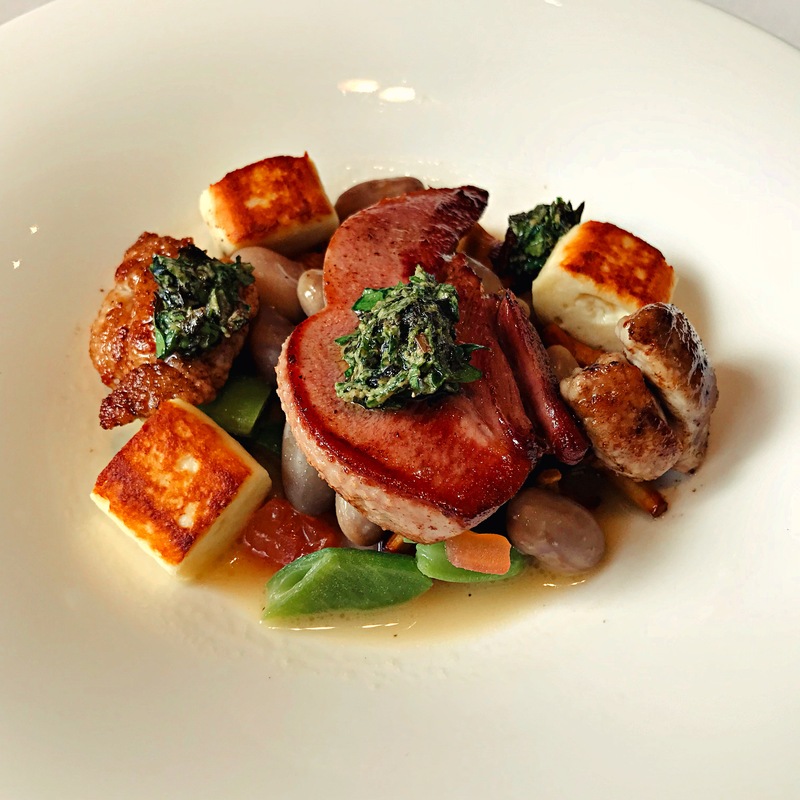 This isn’t about Michelin stars or the Good Food Guide, although both of them have traditionally given Reading a wide berth, preferring establishments out in the shires. It’s about having somewhere properly high end that you might only go to once or twice a year but which will always amaze you and never let you down. Reading doesn’t really have anywhere like that, and I’m not sure it has for a very long time. So Forbury’s used to be quite decent, but it increasingly feels stuffy and dated and the even the market menu is inexplicably costly these days for what you get: I used to eat there relatively often back when I was married and money seemed to mean a lot less, but I wouldn’t go there now. Cerise does some pretty food (or did last time I went) but there’s never anybody in there, and sitting in what’s basically a corridor on your own makes for an eerie dining experience. Thames Lido has managed to build a destination restaurant without quite having the menu or service to match, and don’t even start me on Bel And The Dragon. It would be easy to pick one of the many fancy pubs dotted round Reading – the Hind’s Head, or the Royal Oak at Paley Street, or the Bottle and Glass – but none of them truly hit the spot for me. They’re all a little bit too pleased with themselves, and not quite good enough. Similarly, I know Orwell’s out in Shiplake has a devoted following but my one trip there really didn’t wow me: I suppose I ought to try it again. I love the Black Rat in Winchester, a lovely old pub on the outskirts of town which happens to be Michelin starred but which, unlike l’Ortolan, doesn’t seem to give two hoots about the fact. The compact, sensibly priced set lunch is a wonderful way to spend a Saturday lunchtime, especially after you’ve been slightly loosened up by the fascinating, extensive gin menu (truly Thames Lido could learn a lot from that place). And that’s before you get on to the black bread, a heady mix of squid ink and parmesan and almost impossibly moreish. Equally gorgeous in its own way is Medlar on the Kings Road, which does a ludicrously impressive set lunch for not much money. Their crab ravioli with bisque is etched on my memory as one of the great starters of my life, as is the duck egg tart with duck hearts, and few mains come close to their feather blade with café de Paris snails and impeccable chips served with the glossiest, most beautiful Bearnaise sauce. On my last trip, let’s just say I found myself wishing it was a shorter walk home – and I have no plans to relocate to Chelsea. But this kind of restaurant doesn’t have to be fancy or Michelin-starred. A really lovely neighbourhood restaurant, of the kind Mya Lacarte was in its prime, can also tick those boxes perfectly. One of my happy places is Branca in North Oxford (admittedly a neighbourhood I could quite imagine living in) and some of my nicest evenings – and best places of food – have involved that restaurant. 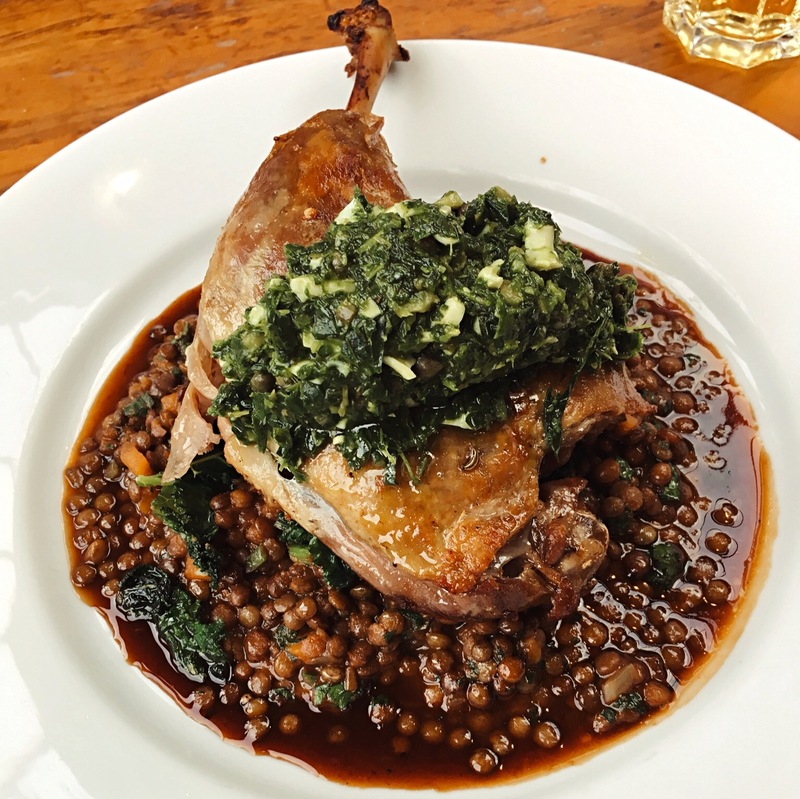 Look at this confit duck with lentils and salsa verde, if you don’t believe me. I thought long and hard about this. On many levels, London Street Brasserie remains the one to beat in Reading, which after such a long time trading is simultaneously reassuring and depressing. It still has one of the best spots in town, it still has one of the only natural sun traps for al fresco dining and the set menu is still good value and impressively diverse. But I’ve always had a feeling that it’s not quite as good as it should be and, perhaps crucially, it’s nowhere near as good as the Crooked Billet, its sibling out towards Henley (and, if you’re talking about special occasion restaurants, I’ve celebrated my last two birthdays at the Crooked Billet with my family). The other restaurant which comes closest is Clay’s Hyderabadi Kitchen. Not because it aspires to be a special occasion or destination restaurant, because (and I mean this kindly) I’m not sure it knows yet what it wants to be when it grows up. The food is up there with anything you can get for miles around, but the room is unshowy and the prices are bafflingly low. But in terms of dishes with a proper wow factor and – if you’re interested in that kind of thing – a damned good wine list, I still think it’s hard to pick anywhere better in town. All that, and it’s almost inside the IDR. It’s become the place I take visiting friends, or family, and it hasn’t let me down. It pleases me hugely that the two best places to take people for a celebratory meal in Reading happen to be one of its oldest and one of its very newest restaurants; some things change, some things stay the same, but Reading in general gets better and better. And that feels to me like a nice way to end this piece, because however much I might want new places to open in Reading we still remain very lucky to have so much. Not to mention how good Reading might still become in the years ahead: imagine if I Love Paella finds somewhere to open in town, the team from Namaste Kitchen move to new premises and Glen Dinning manages to open an indoor equivalent of Blue Collar. And new places continue to open all the time including the latest, a Vietnamese place on Market Place called Mum Mum. There’s plenty to be grateful for – not least that we’re not, and will never be, Swindon. And time for a trip to Bristol again. Edible. This iarticle is SO good and so long….will have to read it again (partly because too much Rioja this evening….) but best breakfast i have had recently was at Spoons in Henley. Outside of The Ding……but worth a visit. Nomad Bakery in Caversham. Not central Reading but well worth a visit. I don’t think I’ve ever been but would London St Brasserie be a special occasion place? One glaring omission from this list which (IMHO) Reading needs is a decent Chinese restaurant. Since the demise of the Peking Palace there hasn’t been one in close proximity to Reading Town centre that rises above the average to poor category. The one in Lower Earley is quite good but too far outside the known universe to qualify. I don’t personally rate Kei in Lower Earley. Memory Of Sichuan does some interesting stuff, though. There’s a Tapas Restaurant in Caversham just over the bridge on Bridge Road just steps down from the newly opened Persian House and directly opposite Promanard Road – a lane behind the Pub. Yes. It’s bad, or was when I went.